A garden designed by John Kenny Garden Design being built now! 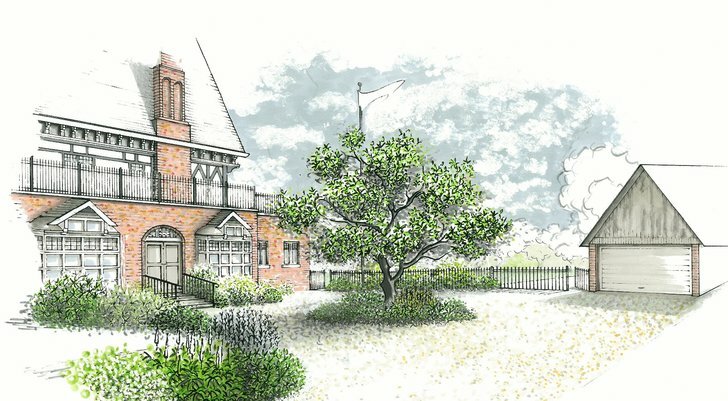 John Kenny Garden Design are project managing a new garden build for a prestigious Thames side property in Maidenhead. The design by John Kenny has been commissioned by a private client on a fabulous location with fantastic river views. The beautiful period house has just been refurbished and now the clients have put all their energy into realising the design which takes its style lead from the elegance of this period mansion and involves all aspects of high end landscaping from bespoke timber joinery and lighting systems to natural stone terracing and composite decking. what sort of thing goes here Anne? not sure what it means 'when viewing full post?'. With the blog you have an overview page. Content above the above "options" panel is page will be shown on the blog over view page . When a visitor clicks read more the content below will be shown on the actual blog entry page, ie viewing the full post. I wouldnt recommend using the full width for an image component and have showed the content you had using the cloumns with a 50:50 split. I have also added a 2 cloumn split on the bottom of the page for you to add the photos. Remember to add your email address in the comment form below. if you hoover over the form and right click you will see the entry field to add your emial address. Work is now underway on an extensive landscaping project for a large detached property on the River Thames near Maidenhead. The neglected grounds needed total re imagining and now a new design has transformed the property into a modern family garden for outdoor entertaining and leisure. The private clients have a keen eye on period detail and ..
Meet Harry Silver - Site Manager and owner of QG Landscapes. QG Landscapes were selected to build this extensive high end garden construction project designed by John Kenny Garden Design. 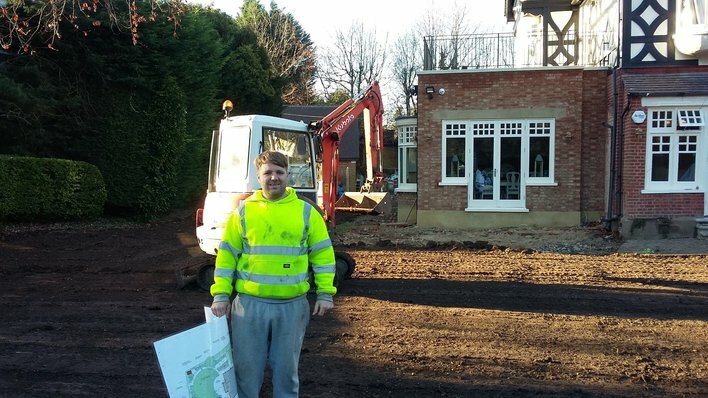 Work is clearly underway and Harry is well versed in all aspects of the project from hard landscaping with natural stone products, timber joinery for pergolas and decking, a bespoke water feature, lawns, a resin bound driveway and sandstone roundabout and a bespoke garden lighting system. Since starting the build Harry has discovered a neighbours love of opera music keeps his men calm and easy going! Harry and his team are very enthusiastic and keen to build the garden to a very high standard. Work will progress through the Christmas period and we should see a finished result come early spring with the grounds all planted with a mixture of select specimen trees and shrubs and topiary all softened with colourful perennials and roses.